I packed my stuff Friday night and drove to Julieta’s house the next morning. Arriving around 5:30, I picked her up and we drove to the store to by goodies and some gas. After returning, we double checked that we had everything we needed and started on our journey. Julieta brought a camcorder and we filmed most of the drive. What I perceived as an easy trip soon began to beckon at my bottom that this wouldn’t be simple. As we drove through Nebraska, the sky was darkening and off to our left the clouds looked as if a tornado or two were going to touch down. We pointed our camera at the area but were “disappointed.” Iowa brought landscape I had never seen before. It had beautiful turquoise rolling hills with a thick fog spread like butter. It was difficult to keep my attention towards the car in front of me. My eyes soon began convincing me that the setting sun and rising moon were a call to stop for the night. We rented two motel rooms and parted company. When we awoke, we immediately got back on the road. We were determined to arrive in Chicago before nightfall so that we could meet her family and make it to Navy Pier to enjoy the Fourth of July celebration. After several hours of driving, we finally arrived. While in Chicago, I got to see two sides of this giant city. The first side, seen as Julieta and I entered, was cluttered and unattractive. There were houses lined up like dominoes with people in front, inside, and on top of them. The first few neighborhoods were filled with black people, and for me, growing up in Salt Lake City it was quite an eye-opening experience. People were everywhere, walking along the street and across the street in front of traffic without giving it a second thought. Then we entered the Latino neighborhoods where my wife had lived. There were street vendors everywhere trying to make a living. The second side of Chicago came at the end of the week when we finally went to see downtown and the lake-front areas. During the day it was quiet between the giant skyscrapers. We were able to see every corner of the city when we took a tour to the top of Sears Tower. Downtown was clean and beautiful, unlike the major residential areas. It was a great experience and a wonderful place to see, however, nothing was able to remove my focus from the objective, which would soon be completed south-west in Nauvoo. The night before leaving, we took her parents to Applebee’s where I gave to them a letter revealing my intentions with their daughter. Needless to say they were pleased at what I was considering. Still, neither they nor Julieta could have imagined what would shortly come to pass. The next day we prepared to leave for Nauvoo. Julieta was excited to see the new Latter-day Saint temple again, and so was I. We entered Nauvoo from the south along the Mississippi River. 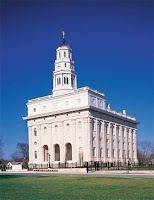 Immediately we saw the Nauvoo Temple and marveled at its obvious beauty. Nauvoo Inn is where we arranged for rooms and we each decided to rest before touring the city. As I lay there thinking about what I was going to do, I felt that now was the time and this was the place. I went down to my car and found my white box. I stuck it in the side of my sock and then pulled my pant down to hide it. I made my way to her room and knocked twice. She answered and let me in. She lay down on her bed and I sat beside her. My heart was beating quickly as I reached down my leg and pulled out the box. Before I knew it I was opening it to her view and asking her “the” question. She was completely surprised, and very fortunate for me, she answered “Yes!” She threw her arms around me and we both cried. After our eyes emptied all they could, I slipped the ring onto her finger, its final resting place. The proposal could not have been more perfect. I was proud of myself and grateful for her decision. Soon we found ourselves with 1500 miles and all the time in the world to plan the wedding.